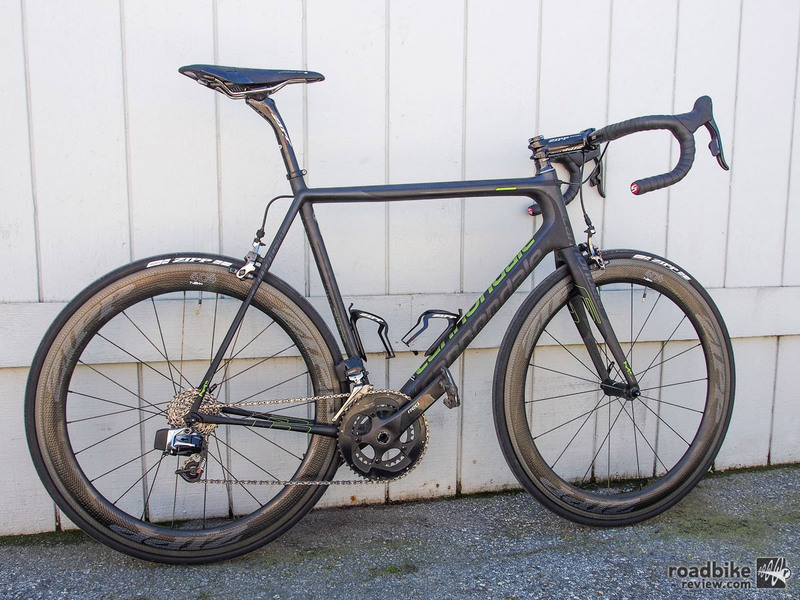 Our test whip was this stealth Cannondale SuperSix Evo with SRAM Red eTap drivetrain and the very high end ($3100) Zipp 404 NSW carbon fiber wheels. Hard not to enjoy the ride (click to enlarge). The first thing you notice about a SRAM Red eTap equipped bike isn’t how smooth or easily it shifts, nor how light it is. What you notice is how great it looks. But utilizing a wireless system, SRAM has cleaned up the two-wheeled aesthetic like never before. Gone are the cables or wires that connect shifter to derailleur, replaced by an unseen proprietary 128-bit encryption system called Airea that literally communicates its rider’s intentions through thin air. It’s beautifully simple and clean, like what a bike looks like on a designer’s computer screen before the realities of functionality are drawn in. My first up-close encounter with the new group came at the Sea Otter Classic, where SRAM was kind enough to loan me a high-zoot Cannondale SuperSix Evo carbon fiber race bike for the annual Sea Otter Gran Fondo, a difficult 92-mile ride on the ever-rolling rural roads that surround the Laguna Seca Raceway. 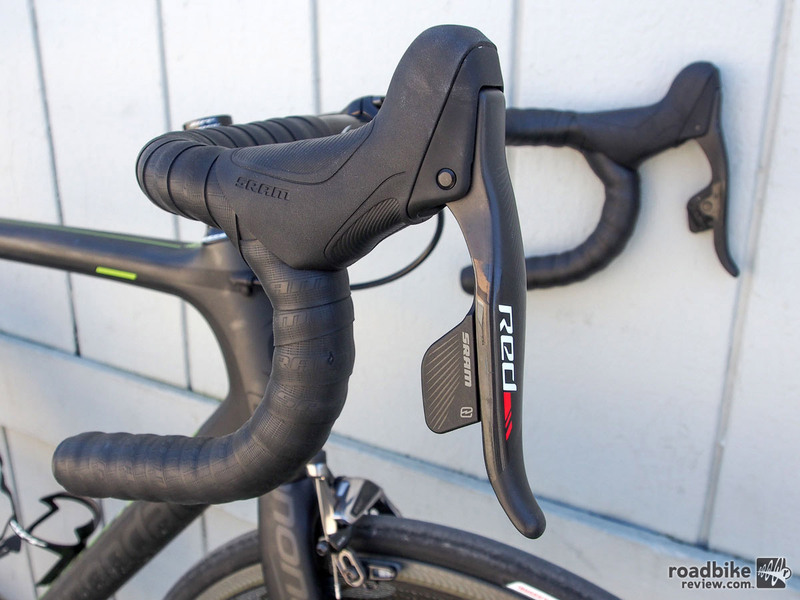 Brake hood ergonomics are similar to standard SRAM Red. The shift lever delivers an audible click (click to enlarge). It sounded easy enough on paper, which is probably why the new group has met with such rapid consumer adoption. Slusser claimed it was selling so well SRAM couldn’t make it fast enough. “Customers are starting to get angry,” he said. That’s not necessarily a bad problem to have, especially considering some of SRAM’s other recent product releases (road disc brakes, for instance), which engendered a different kind of anger. 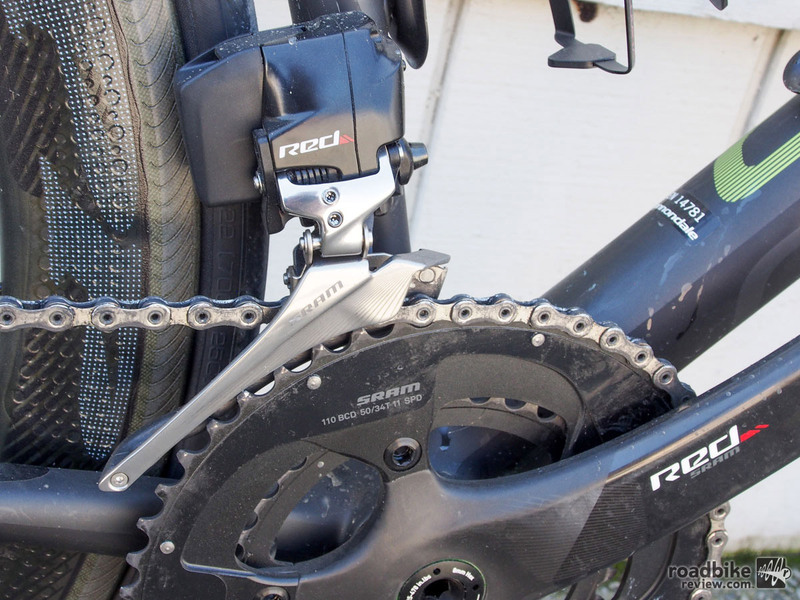 Unlike the days of old, SRAM’s front derailleur shifting was essentially flawless (click to enlarge). Find out how to install SRAM Red eTap wireless electronic drivetrain system. It takes one hour to charge the system’s two derailleur batteries from full dead. You can ride an estimated 1000km or about 60 riding hours on a single charge. And the batteries are interchangeable, so if your rear derailleur goes dead, you can move the front battery to the back and still have a 1×11 set-up to get home. Meanwhile, smaller disc-style batteries inside the shifters last an estimated two years based on a 15-hour-a-week average ride time. Point being, you don’t have to worry about always plugging your bike in after you ride. The eTap system’s other highlight feature is what are called Blips. This is SRAM’s answer to Shimano’s sprint and climbing shift buttons, but with more customization options. Users can place Blips anywhere on the handlebars. For instance, Slusser said he’d located his sprint shifters farther down his bars than most just because that’s where he likes to place his hands when going all out. The Blips remote shifter buttons plug into these ports and can be located anywhere on your handlebars (click to enlarge). The Blips buttons are about two centimeters in diameter and require slightly more force than the Shimano counterparts, which helps assure no mistake shifts when changing hand positions. 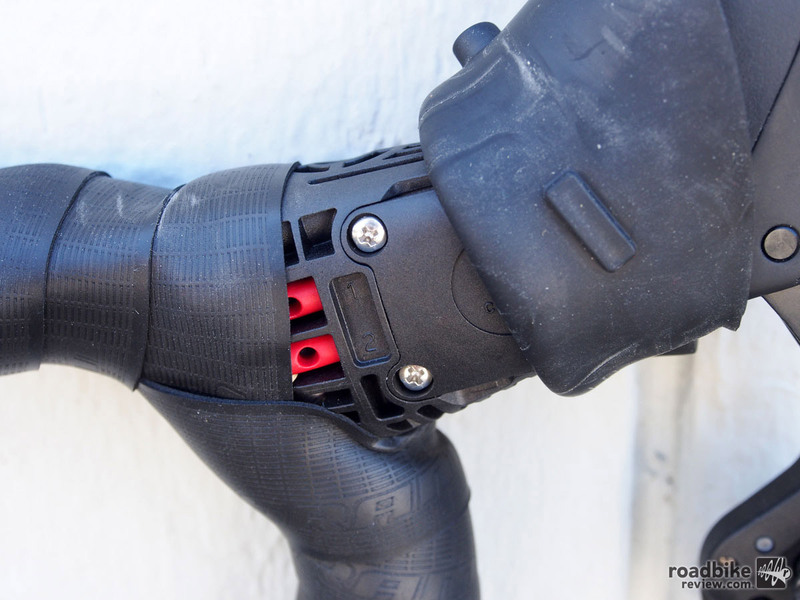 SRAM offers four lengths of Blips wires (no, the system is not completely wireless). Each Blip plugs into a port in the back of the shifter under the brake hood, and can then be routed under the bar tape to wherever you want it. “You wont feel the wire under your tape,” assured Slusser. Where can one get the shifters and derailleurs for $1250?!? merlincycles but they won’t be in stock for awhile. I ended up paying a premium at my local shop.